Static steps which are fitted with 2 x 75mm dia. wheels. When steps are tilted, they can be easily moved to a new location. Welded steel treads with ribbed rubber top surface. Ribbed rubber surface on steel treads. 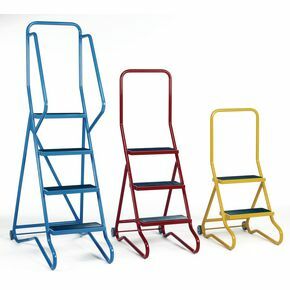 Steps are wonderful additions to the workplace; they offer an easier and safer way to gain access to high up areas. Our economy tilt and pull steps are an excellent addition as they are so easy to transport and manoeuvre. They are static steps when in use with a sturdy frame and base, but when tilted are easily moveable on the two fitted 75mm diameter wheels. The tyres are made from non-marking rubber tyres, making them ideal for use on all floors. Welded steel treads with ribbed rubber top surface offer support and brilliant underfoot grip. 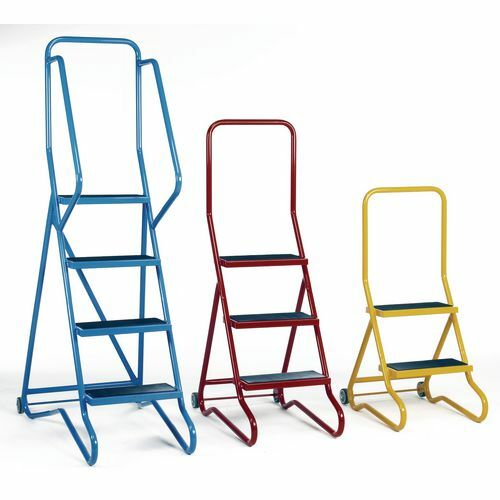 The steps are available in three platform heights; 510mm, 762mm, 1020mm and there are four colours; blue, red, grey or yellow. Our economy tilt and pull steps are ideal for at home or in the workplace, providing an easily moveable set of steps. They come with a 12 month guarantee and FREE UK Delivery.